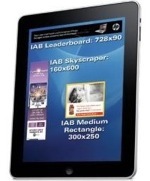 Mobile advertising network Greystripe has had a lot of experience running ads on the Apple iPad. Recently they were willing to share some of the experience gained from the First 100 iPad ads, which showed a greater than average level of consumer interaction. “We’re experiencing a growing interest in integrating touch-based interactivity with video content. We expect this to continue as the number of people using tablets skyrockets this year with the launch of the iPad 2 and a suite of Android tablets, ” said Dane Holewinski, Director of Marketing at Greystripe. Greystripe have also found that user engage differently with tablet ads than they do on smartphone’s. This is due to the larger touch screen and its use as an entertainment device.